The launch of the Juno spacecraft last Friday gets us back in business around the Solar System’s largest planet, but also has useful exoplanet implications. To understand why, consider just one of the instruments carried aboard the spacecraft. The Jupiter Energetic-particle Detector Instrument (JEDI) is designed to measure how energetic particles flow through Jupiter’s magnetosphere and interact with its atmosphere. Developed at Johns Hopkins Applied Physics Laboratory, JEDI will be looking at the interactions that produce the most powerful auroral phenomena in our system, and what we will learn has broad applications. Image: NASA’s Juno spacecraft is shown in orbit above Jupiter’s colorful clouds in this artist’s rendering. Juno will arrive at Jupiter in 2016 to study the giant planet from an elliptical, polar orbit. The spacecraft will repeatedly dive between the planet and its intense belts of charged particle radiation, coming only 5,000 kilometers (about 3,000 miles) from the cloud tops at closest approach. Credit: NASA/JPL-Caltech. The first spacecraft designed explicitly for a magnetic mapping mission, Juno will be operating in a tough environment, one in which electrons, protons and ions are energized by the planet’s fast rotation. Other than the Sun, no other destination NASA has visited presents such radiation challenges. In this orbit, Juno will need to take advantage of a protective shield made of titanium to preserve its sensitive electronics. This ‘vault’ weighs about 200 kilograms and should dramatically extend the life of the spacecraft’s instruments. Juno will circle Jupiter’s poles for a year after arrival in the summer of 2016, the choice of orbit adding its own radiation protection — the spacecraft will spend little time in the intense radiation belts around Jupiter’s equator. The elliptical orbit will bring Juno closer to the giant planet than any other spacecraft, its polar orbits covering the entire globe during the course of an Earth year. At its closest, the spacecraft will feel the full brunt of the magnetic field, some 10 to 12 Gauss (Earth’s field is about half a Gauss), while further out — Juno will range farther out than the orbit of Callisto — it should encounter a field 10 million times weaker. Each of its magnetometers is equipped with two star cameras to determine the sensor’s orientation in space, allowing exquisite accuracy in measurement. Variations in the magnetic field will help scientists visualize how the planet’s magnetic system operates and offer insight into the planetary dynamos of gas giants. Thus an account of the discovery of large Jovian moons is now on its way to the planet Galileo did so much to reveal to humanity. It’s also worth remembering that Juno will be equipped with three huge solar panels, making it the most distant probe ever to be powered by the Sun. Fully extended, the probe will be over 18 meters wide as it soaks up as many solar photons as possible from a distance of 800 million kilometers from the Sun. We’ll have to learn as much as we can from Juno in relatively short order, for the mission is designed to survive in its Jovian orbit for little more than a year. You missed the truly geeky part, which is that they’re not just “figurines”, they’re Lego “minifigs”. Of course no human is going to see these minifigs or the Galileo dedication plaque in person ever again, as they will be destroyed along with the Juno probe when it is plunged into Jupiter in 2017 to avoid any contamination of the Galilean satellites, especially Europa. One reason the LEGO minifigs were made and placed aboard Juno was to interest and inspire school children to learn more about the probe, its mission, and its target planet. But is this really necessary, or does this show the sad state of current education, when the knowledge of and about the mission profile and Jupiter itself should be more than enough to inspire and excite imaginations? After all, Juno is going to spend almost half a decade traveling across hundreds of millions of miles of deep space to reach a giant alien world that could swallow up over 1,200 Earths, has no real solid surface, at least 63 moons circling it (four of which are utterly fascinating in their own rights), a massive hurricane centuries old that is several times larger than our entire planet, and is surrounded by a huge and powerful radiation belt that could kill an unprotected human in seconds and will eventually do the same to Juno after a year. And these are just the highlights! So why do we need to add trinkets which will never be seen again and are actually misleading in Juno’s case, as NASA says her magnifying glass (which really looks like a frying pan) is for searching for the “truth”, which includes monitoring the “mischief” of her husband, Jupiter (this was in their official news release). Yes, let’s explain that one to the kids. I’ve been trying to find an update on spacecraft health/operations but having no luck. I’m assuming the solar panels deployed and all is well. Anyone know? Would prefer missions such as a rover and/or “romarine” (rover come submarine) to Europa, a rover or boat or balloon explorer at Titan and humans on Mars to determine whether there is or ever was life there. One of THE critical questions for us to answer (IMHO or course) is, is there life else where.? If so what kind? Virginia, the solar panels have indeed deployed and all looks good so far. Larry, the “magnifying glass” most definitely looks like a frying (for one thing, the figurine is holding it at the wrong angle to examine anything; for another, it’s totally out of scale for a magnifier). Maybe the toy makers thought it would be funny (winkwink nudgenudge) but I found it annoying and embarrassing. Regarding ljk’s comment (“why do we need to add trinkets which will never be seen again”): Dude! because legos are fun! Sheesh. Someone needs a hug. Whimsey and fun and astrophysics. Nice combo, IMHO. I found myself smiling when I read about those ‘trinkets’. And the nod to the Italians’ proud history, too, was a very welcome thing. At 3000 miles, though, one wishes there were cameras on the thing. oh, gosh, Paul, I spoke too soon; turns out Michael Malin has a camera on board. It’s apparently outside the .4″ titanium protective box, though, so is considered to last only 7 orbits. But oh what pictures they will be. Michael, I’m with you on that — any camera in Juno’s orbit is going to see some spectacular scenes! Ah, Michael, I was waiting for someone to tell me that the LEGO minifigs are just toys and that I should lighten up (the hug was a nice touch, but no thank you). You did not disappoint. However, did you really read and absorb any of what I said in my original post? I don’t have anything against these trinkets per se – heck, I guess the Juno team technically could have put anything they wanted on their space probe since it is going to be destroyed just six years from now. At least they dropped the idea of placing a piece of bone from Galileo Galilei himself aboard Juno; now THAT would have been a waste for future historians, to say nothing of the fact there is only so much of the man left to go around. If they really want these little figurines to inspire our children, why isn’t NASA or LEGO mass-marketing them? Not only could they make a few bucks, but they could add some information about Juno, Jupiter, and the characters the minifigs represent on the package or in a brochure accompanying the toys. That could be a win-win situation and it would at least redeem this so-called gesture to the exploration of the Sol system at least in my eyes. This could also give them the opportunity to better explain Juno especially, which they seemed to have difficulty with and which is why she ended up with that silly-looking magnifying glass and the coy explanations in the NASA news release. The Juno of ancient Roman mythology (Hera is her Greek counterpart – both were married to Zeus/Jupiter) was the goddess of many things, but primarily marriage, fidelity, and childrearing. However, Juno’s biggest claim to “fame” seems to have been spending a lot of time chasing down Jupiter while doing his Bill Clinton thing and punishing those who were the focus of the Chief God’s, um, attention – her Greek counterpart’s depiction in Disney’s animated Hercules notwithstanding. It is fairly obvious that NASA felt the need to include at least one female representative that bore some relation to Jupiter. Juno was the “safest” choice because just about every other female in Jupiter/Zeus’ life was essentially a conquest, and we don’t want to have to explain that to the school kids (the ancients were a lot less concerned about political correctness than we are by far, or that their deities needed to be upstanding examples of moral behavior). The other problem is that these days it seems the placing of items on at least NASA’s deep space probes has gone from serious representation of the purpose of the mission and those who made it possible to the equivalent of a small town’s time capsule. New Horizons, only the fifth probe to ever leave the Sol system, is a major case in point. Maybe the current generation does not care as much about what the future might want to know about our present era, but preserving important items that would explain what we were like to our descendants (or maybe even some other spacefaring intelligences) can be done in no better place than aboard a vessel permanently bound for deep space. Ah well, perhaps these minifigs and other such trinkets will be more than enough explanation to our distant children. Well, Larry, they already named all of Jupiter’s large moons after his lovers — Io, Callisto, Europa, Ganymede. So finally, the sister-wife gets sorta kinda included as a “naughty” afterthought, a sadly diminished version of the Great Goddess she once was (a trace survives in one of Zeus’ names; Heraios: consort of Hera). If we simply assume that NASA knows what its doing, then these figurines signal that its long-term future lies with attracting the prepubescent. What if they’re right and those in the 13-25 age bracket are a cause lost to them? This may not be as desperate as it sounds, since I remember when I was six, all my contemporaries had detailed knowledge of the Apollo missions. Actually they knew an impressive number of space myths too, yet I believe that had any similar 6 year old been consultant to the film Armageddon, they could have fixed at least half its errors. Thus all is not lost. 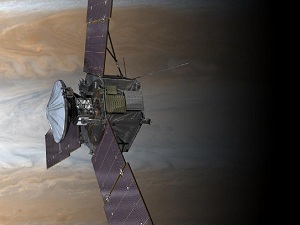 Just curious, how does Juno expand upon what we learned from the Galileo mission? This provokes the following idea: The economic crisis will be with us for such a long time, that only those who are children today will be able to invest in space exploration again. Perhaps the naming issues with future space probes could be solved if NASA decided to call them after real people who made important contributions to the worlds they will explore. These days we seem to have either names that are just descriptive of their mission (LRO, MRO – and yes, I know about Lunar Orbiter from the 1960s) or cutesy labels chosen from a voting contest, the nuclear-powered Mars rover Curiousity being the latest of these actions. While not solving everything, giving a deep space probe the name of a real human being who made important contributions to the place the vessel is going to will eliminate any concerns one might have about naming the probe after a religious deity or politician, be it ancient or modern. NASA can also use this opportunity (heh) to honor said scientist, who may otherwise not be well known to the general public, and have a chance to teach same said public about what this person did to further our understanding of that celestial destination. And since the person being so honored was a real one, they might also inspire current generations to take up the mantle of space exploration or some aspect of science themselves. BTW – Call me nieve, but while I recognize this economic situation as less than fun, I also question if it will last long enough to keep an entire generation of people from dreaming about space. Just check out the recent topics in Centauri Dreams and you tell me if space dreams are dying at least as far as public enthusiasm is concerned. This human-made crisis will only win if we allow it to overwhelm us, and our ancestors have certainly been in far worse pickles and survived. It’s a pity that Juno probably will not have a Cassini-style extended mission; IIUC, radiation damage will make that unlikely. A year around Jupiter is still pretty good. Something that seems to have gone unnoticed: Juno will be the largest probe yet to pass the orbit of Mars. She weighs in at around 3.5 tons — about 50% more massive than either Galileo or Cassini. Roughly the mass of a Cadillac Escalade, give or take. Juno is the first mission to operate off solar power at such a distance from the Sun, which is interesting from an engineering perspective, but it’s also the first time we’ve optimized a mission to study the Jovian magnetosphere, so it should be able to provide much more data than Galileo on that topic. And, of course, its polar orbit allows unprecedented study of the poles and auroral phenomena. I’d be interested to see a comparison of Juno’s instrument package vs. Galileo’s. It’s easy to find descriptions online, but they’re not very informative. One difference, of course, is that Juno’s sensor technology should be 20 years more advanced. Galileo launched in 1989! Another is that Juno is going to get a lot closer to Jupiter. IMS Galileo didn’t get closer than about 4 Jupiter radii (except on its final approach, of course). Juno will make a bunch of passes at just over 1 Jupiter radius. Anyway — point is, Juno’s equipment should be quite a lot more advanced. Mid-2000s technology vs. early 1980s. How that should play out in actual observation I do not know. Gas giants are believed to form by the accretion of hydrogen-helium gas around an initial protocore of rock and ice. The question of whether the rocky parts of the core dissolve into the fluid H-He layers following formation has significant implications for planetary structure and evolution. Here we use ab initio calculations to study rock solubility in fluid hydrogen, choosing MgO as a representative example of planetary rocky materials, and find MgO to be highly soluble in H for temperatures in excess of approximately 10000 K, implying significant redistribution of rocky core material in Jupiter and larger exoplanets. Lego figures to Jupiter on Juno spacecraft. Why send toys into space? Lego figures to Jupiter project is an attempt to inspire children to be interested in science, math, engineering and technology. The Science Programme Committee of the European Space Agency has recommended that the next major space mission for ESA be an orbiter mission to the Jupiter system named JUICE, the JUpiter ICy moons Explorer. This mission would launch in about 2020 and explore potentially habitable moon around the gas giant, Callisto, Europa, and Ganymede. Other missions being considered are ATHENA , the Advanced Telescope for High-ENergy Astrophysics (originally called IXO) – which would be the biggest X-ray telescope ever built — even though smaller in scope than the original IXO) and study the extremes of the Universe: from black holes to large-scale structure ; and NGO, the New Gravitational wave Observatory, a smaller version of LISA, a space-borne gravitational wave detector which would place a three satellites in orbit. “This is a big blow to space based astrophysics,” wrote European science blogger Steinn Sigurdsson, who added that rumors are floating around that the NGO science team may be disbanded immediately, even though the new report issued by the Science Programme Committee is just a recommendation.